Little mad at myself. Started a bit earlier than usual, still ended up at this point. Anyway, will add in colors tonight. Are they gonna address why they each have one parent who looks like them and they seem to be married or something? What’s there to address? A couple adopted two of them and the dad coincidentally share Sandy’s hair colour. The mom looks nothing like Wu. Mom and Wu share a haircolor, too, y’know. Black hair is the most common hair colour in the world, so I didn’t feel like that was worth commenting on, considering that their skin tones are clearly distinct. Sandy-dad coincidence was worth commenting on since ginger is probably the least common or close to it. Could be that they bonded over it, and got along after the “oh, cool, an adult like me!” phase — heck, Sandy and Wu might’ve approached their new parents, because it tickled them. I’m going to guess that Dave just thought it’d be funny/cute to design their new adoptive parents that way and that there’s no further meaning behind it than that. Ladile has the right of it. I just thought it’d be nice if they each had a parent they “took after”. There’s no biological connection between them. For Wu’s biological mother and Sandy’s biological father to end up married, then just so happen to adopt heir own biological kids, would require coincidence shenanigans on a tier so elevated I may as well make them win the Mega Lotto and build a sky-mansion. Oh, kinda like someone adopting somebody and subsequently finding out their new adoptive kid is a mortal enemy of a long-lost child of that parent? Well maybe Wu’s aunt wanted to adopt him and Sandy’s uncle wanted to adopt her but they couldn’t afford to do so at first. Then they met and got married or whatever, and recently became financially stable enough to adopt them both. That’s not too “shenanigans”, is it? But yeah, just chalk it up to coinky-dink. It was only appropriate that they turned out to be siblings. After all, Wu is in a committed relationship with Little Miss Muffet. Ha ha, now THAT’S a callback! I thought it was Moonsong who was infatuated with Little Miss Muffet? I do not miss Tony, although he did add dramatic conflict to the comic. Ah, I could have been mistaken. Dave, one of these days, someday far too soon, you are going to realize that you are not invincible, not immortal, in fact you are not who you were even 20 years ago. Yeah u will miss your younger self. Hint from the expert: learn to forgive your brain for letting your plans down. Honest, you do a great job posting. Cut yourself some slack. I just read through 15 pages of the smackjeeves catalog of comics and nearly 2/3 of them are on hiatus with less than 15 pages. One guy picked up and finished his comic AFTER a 12 YEAR HIATUS! We So appreciate your not doing that to us. We do! Her are the statisics- random search for comics. 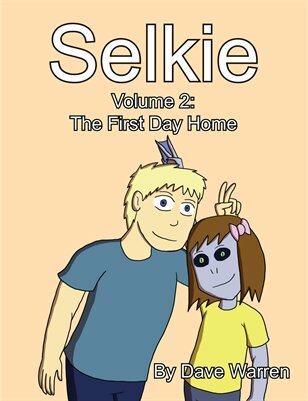 Dave w/ “Selkie”: total pages (To Date): one thousand two hundred and twelve. I think that makes you, clearly, the winner-winner-chicken-dinner! Be gentle with yourself, this comic makes me laugh, makes me cry, shows me that the good guys screw up occasionally, and need forgiveness. And that the bad guys are not bad throughout, but can grow and change, given a chance. Andi is not the monster we thought, Mandy has been taught not to trust people — but is learning to. Selkie is not the freak she was told she is. Howard Tayler, who started doing Schlock Mercenary in June 12, 2000 and has managed a daily comic strip for every single day with zero misses in almost 19 years is a statistical outlier and shouldn’t be counted because I’m not convinced the guy is fully human. Kinda like Branden Sanderson among authors. Which is funny, because Sanderson and Tayler do a writing podcast together (along with some others). This is an important reminder for any content creator who’s serious about their craft (and their responsibility to the fandom). There are a variety of reasons that projects don’t get done in a timely manner, and living in a constant / frequent state of self-blame is not emotionally healthy for anyone. I had to come to grips with this after I bit off more than I could chew, ended up with multiple projects way past deadline (after hyping them up! ), and then fell into the Loki fandom and got my brain hijacked by the Muse (who is currently doing good work through me, just not the work I was expecting to pour my time into these past few weeks). I even wrote a fic with a meta element where the character’s dialog is basically my viewpoint (troubled by being too weak/undisciplined to have done everything in a timely manner); see the link under my name there. So, yeah, if you need to step back a bit, do that. Don’t let yourself get into burnout by pushing forward at a pace you can’t consistently maintain. Artist vacations are good for the audience as well, since it can have a positive impact on the creator’s work in the long run, and avoid some problems, even if it’s disappointing in the short term. What Kilyle said. Any regular webcomic reader learns this. I would just add that you can wipe out ALL demerits, and be admired above many others, simply by giving a return date you KNOW you will be able to keep (don’t allow even a smidgen of wishful thinking to affect this!) and then coming back exactly when you said you would. If you can’t manage this, well, no worries… you’re still way ahead of almost everyone else. Sorry to comment here, Dave; but after the website adjustments, I can no longer enter the comment section of the current page or view previous pages on The Adventures of Sue and Kathryn. I get a warning about the HTTPS contents not being properly secured. Appears to be mostly fixed. I still get a pop-up warning about an error, but the pages eventually load at least. Mom’s earrings are yellow/gold, as well. It is kind of fun having just those few bits of color. Indeed! Those freckles are indomitable! A bright spot of color in a sad, dark world. Adorable. Dave: fwiw I got a bit confused, this page is “selkie-1212” rather than “selkie1212” like most of the previous would have led me to believe. Yeah, I forgot to remove the hyphen (by default it’s put in, I normally remove it). Fixed. I tend to do a lot of archive bingeing and noticed something. All the way back in this comic https://selkiecomic.com/comic/selkie1147/, Selkie points out that she didn’t know Sandy had a Middle name and responds with she has many things. What if they had gotten adopted way back then, didn’t tell Selkie and was dropping hints like this all this time! ?